Three out of four of us love this recipe. ‘Dot’ is not so into it, she has only just turned eight years old and still gets a little turned off by bits of green herbs in her food. 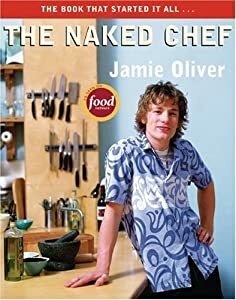 This is another tried-and-true recipe from Jamie Oliver ’s book: The Naked Chef. You can find the recipe on page 95. We try not to eat too much tuna on a regular basis because of its potential for high levels of mercury. But when we do have it we either order it at our favorite Japanese Restaurant where we know the chef and respect his standards for quality control or I buy it fresh from Longliner Seafoods Ltd. at Granville Market. I don’t always follow the recipe exactly. If I don’t have a dried red chili, I use a teaspoon or so of dried red chili flakes. And in place of coriander seeds, I will use a generous teaspoon of ground coriander. And I usually add more garlic. Those are my only deviations. 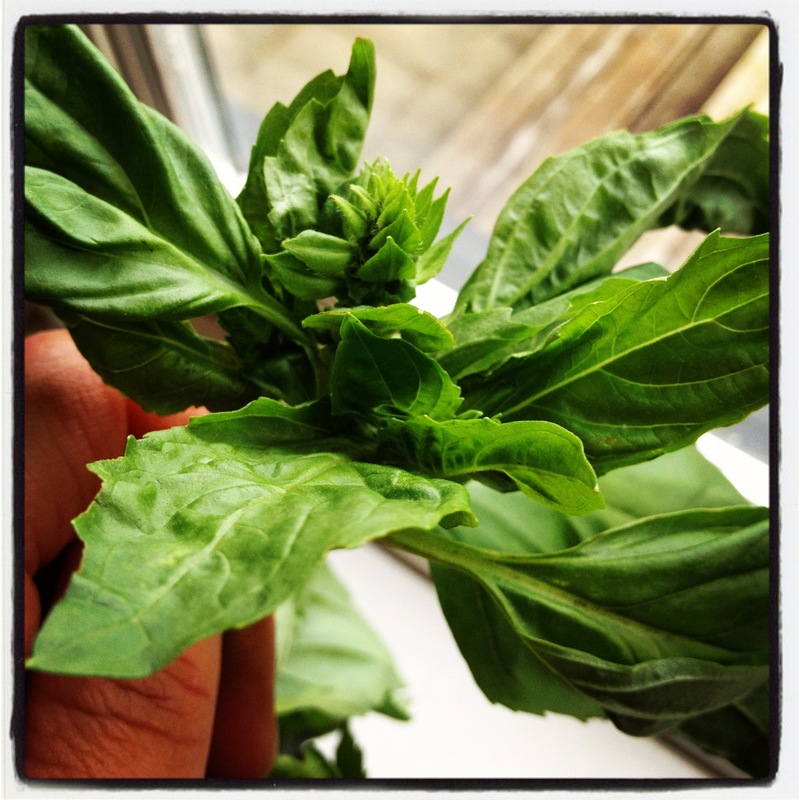 Mix together in a small bowl: red chili flakes, ground coriander, crushed garlic, chopped basil & cilantro and lemon juice. Add sea salt & freshly ground pepper if desired. 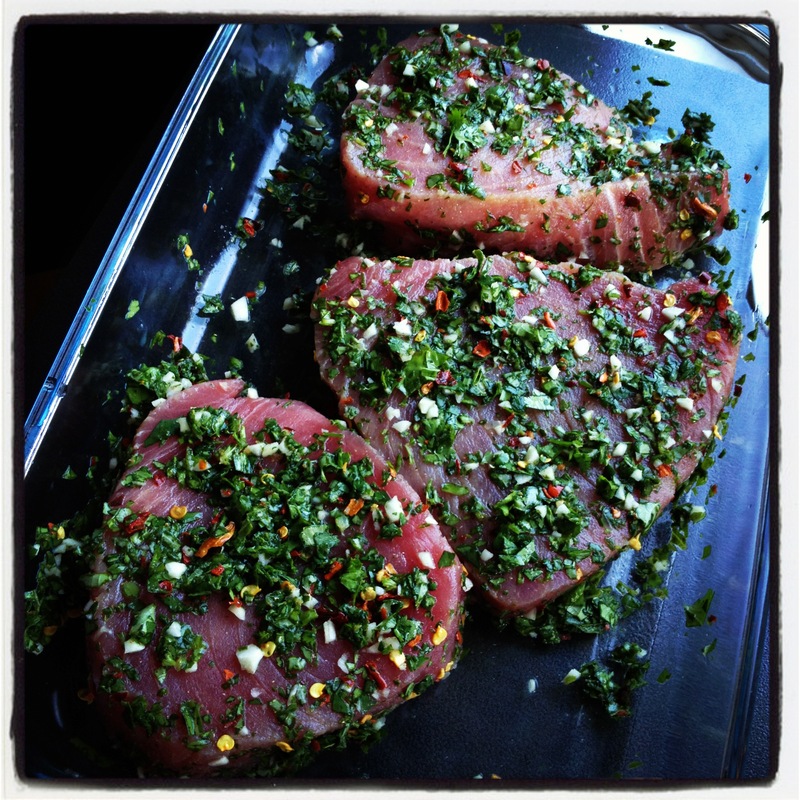 Rinse Tuna Steaks with cold running water, pat dry and place on a dish big enough to coat each tuna steak with the herb mixture. Preheat a large frying pan. Jamie says to get the pan “very, very hot” then pour some oil on a paper towel and quickly rub the frying surface of the pan. Do this quickly and only once the tuna steaks are ready to go immediately into the pan, otherwise, the oil will start to burn. Actually, rather than tossing the steaks in the pan, be precise with placement because they will stick onto the place you put them. Once in the pan you will not want to move them around. After 45 – 60 seconds of searing, it will be easy to turn them over for another 45 – 60 seconds. Letting each steak sear for 45 – 60 seconds on each side. 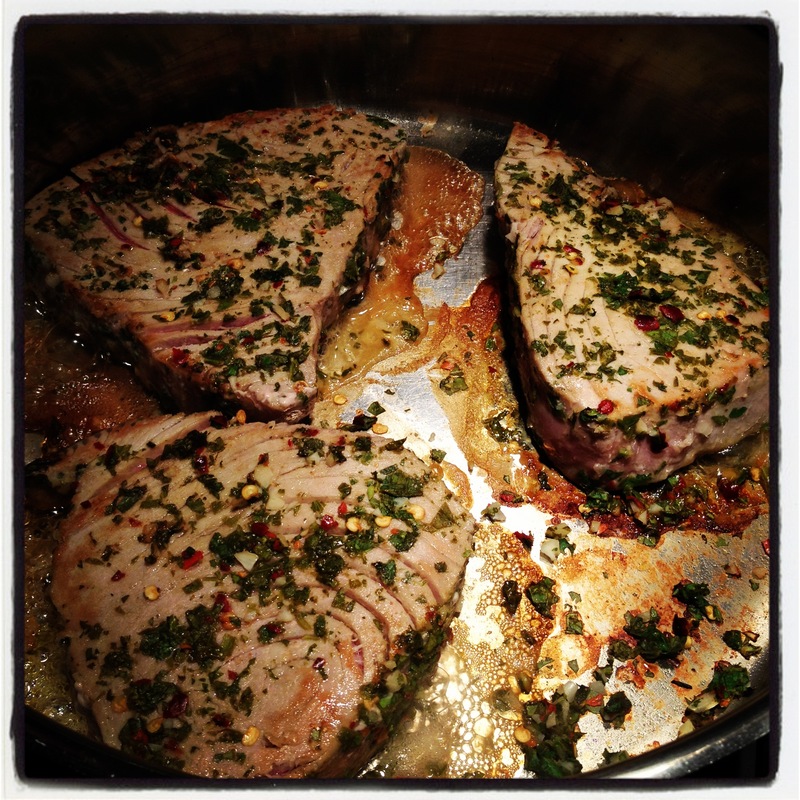 We (the adults) prefer our Tuna Steaks cooked a little more than traditional searing. Our son, however, prefers it closer to sashimi – I try to strike a balance. We leave our raw fish eating for our Japanese Restaurant outings. You will notice in the finished product at top, that the centre of the fish is more pink than red. I will sear them for 90 seconds on each side, then cut through the middle and see how it looks. Remember to factor in that even once the fish is removed from the pan it will continue to cook a bit longer. This is the kind of dish that you want to cook and serve immediately. So having the rest of the meal prepared and on the table makes for a winning combination. Sometimes when I know that I want leftovers, I will intentionally sear the Tuna Steaks for less time so that when I reheat them the following day they will be just right and not be cooked through like canned tuna. 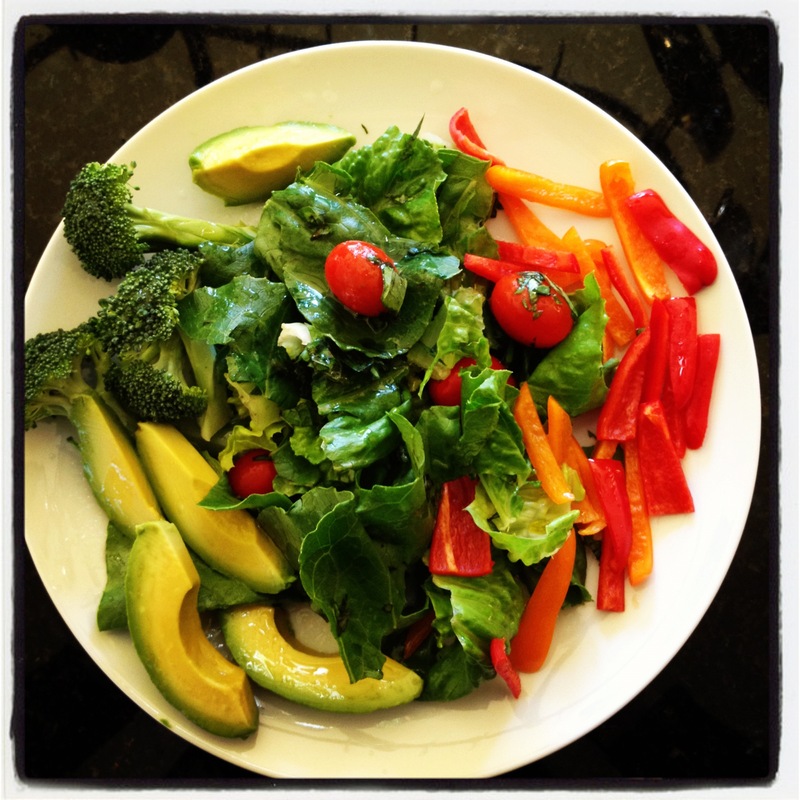 They are also great served cold on a salad the following day; I create my version of a Salad Nicoise. Serve with an extra wedge of lemon. 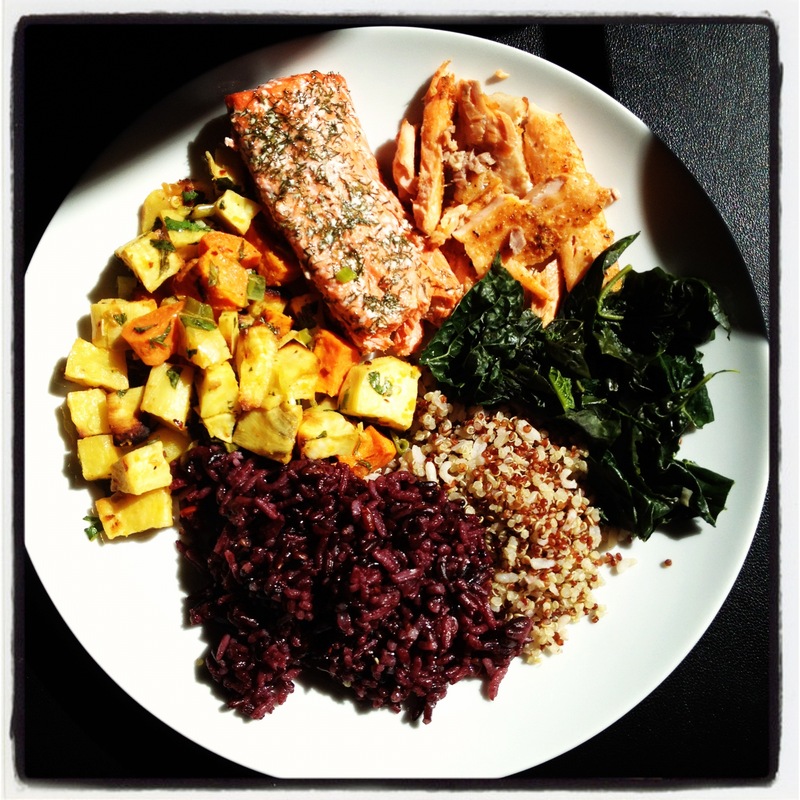 I like to serve with a green salad, steamed kale, roast sweet potatoes and brown rice. The possibilities are endless. This recipe averages out as Neutral for all types. 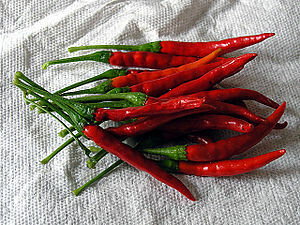 However, A and AB blood types, both secretor and non-secretors should omit the red chili peppers. 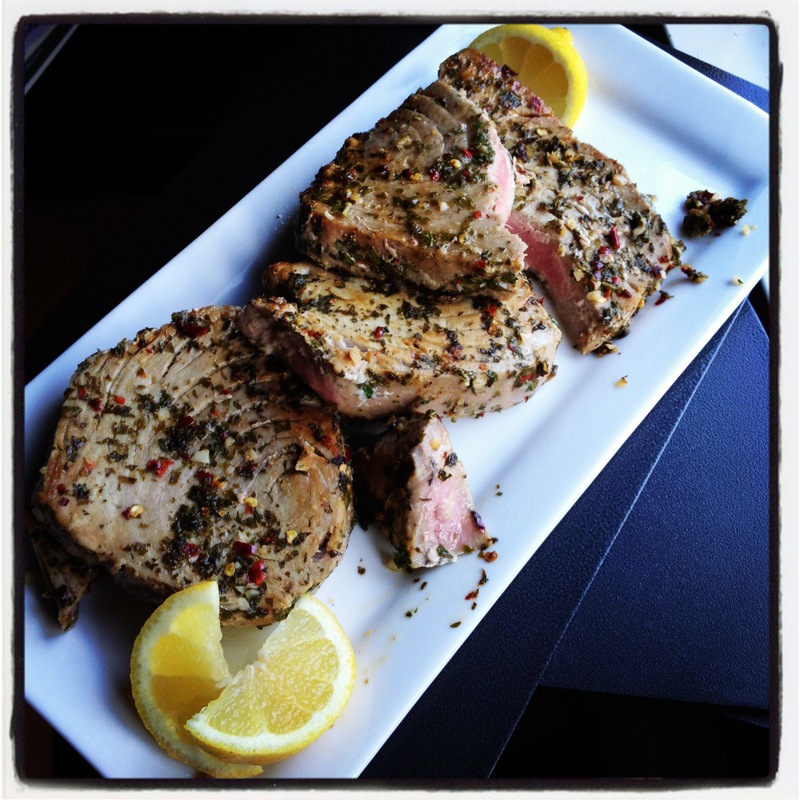 Tuna is listed as Beneficial only for AB blood types, for both secretor and non-secretor. This table is accurate as of the date of publishing this post. Check with the source for an up-to-date listing at Dr. D’Adamo Type Base 4. Click on any food item and it will show you an incredible page summarizing everything you might need to know about that food. Wow! Really, check it out.